If you are looking for a top-quality caterer serving Palo Alto , consider serving Pizz’a Chicago’s signature deep-dish pizza at your next event. Hosting a successful event requires enough planning and logistical arrangements, and adding involved catering orders with multiple dishes will simply make it more complicated. 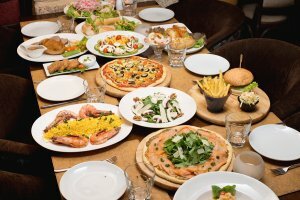 A pizza party creates a fun, relaxed atmosphere and also allows you to suit a wide variety of tastes and dietary needs. Read below on tips for ordering catered food. The more courses you have, the more expensive and involved the event will be for you. Multiple courses usually require servers, who you will need to pay. Also, more courses means more dirty dishes and flatware, which you will have to pay to rent and to wash. Pizza is a great option because when you select the toppings carefully, it can have a good balance of nutrients, including protein from meats or mushrooms, calcium from the cheese, and fiber and vitamins from the veggies. When you are ordering catering, it’s a good idea to make sure that all the major food groups are represented. You want your meal to have carbohydrates, protein, starch, fiber, and vitamins, so you should make sure to serve enough vegetables. Ordering pizzas with toppings like mushrooms and peppers allows you pack more nutrients into every bite. You can also order a large salad for guests who prefer a light side dish. These days, many people are vegetarians, and many eat gluten-free as a lifestyle choice, even if they don’t have celiac disease or a special gluten sensitivity. When ordering individually catered dishes, it can be very difficult to accommodate all dietary restrictions, and to ensure that people receive the correct dishes. When you have a pizza party, however, you can simply order special gluten-free pizzas, and other pizzas with no meat toppings. This makes it easy for those with these dietary restrictions to serve themselves a delicious slice of pizza.